Great for adding lights to your garden. They can also be used as path or walkway lights. Different styles. All items use 12V. We also carry Outdoor Transformers for these lights. Low voltage landscape lighting is inexpensive, meets the safe illumination and increased security needs of outdoor lighting and gives a pleasantly soft, warm light. Low voltage landscape bulbs are generally 6 to 12 watts, incandescent (like traditional indoor light bulbs, lit by a glowing wire) and are no more than slightly warm to the touch. Low voltage lighting comes in sets, since the step-down power transformer must be designed to handle a specific power load. One transformer will power a designated number of lamps, multiple sets may be needed in a lighting plan and all lamps in a set should be used for most efficient operation. Advantages Low Voltage Landscape Lighting. 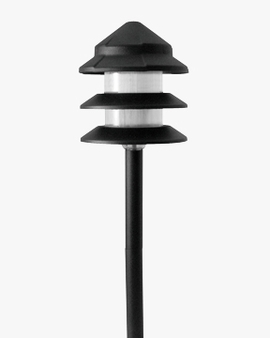 Low voltage landscape lighting must be purchased and installed in sets. These sets each require a transformer (and dedicated outdoor power outlet) and use of power lines to each lamp. This involves more elaborate installation than with solar lighting. This hard-wiring gives an advantage over solar lamps in that low voltage lamps are harder to steal and if taken away from their transformer, are useless to the thief. While some people dislike the light given by LED lamps, the soft light from low voltage lamps is considered attractive and soothing. Low voltage bulbs have expected lifetimes of 2 to 4 years, depending on outdoor conditions.